Created with 100% a sun-grown, high-grade Honduran Corojo wrapper, every Camacho Corojo premium cigar offers a flavorful blend that is truly superb tasting, fully-aged with a distinctive 'Havana-like' flavor. Rated as one of the strongest cigars on the market, these hand-rolled premium cigars have a bold taste being infused with Corojo fillers that are three times primed, Corojo binders and bundled up with a Corojo wrapper that’s been primed five times. 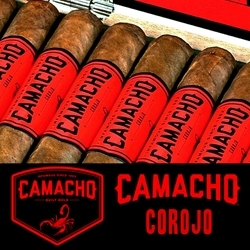 This Camacho line has taken the Corojo and really dialed it up for a rich, robust flavor that makes it a great full bodied blend. Sit back and relax with a good smoke, that’s how it should be every day! Try this ritual out with a box of Camacho Corojo premium cigars. Check out all the styles available here today for a discount price! Call us for more details!